My stock count is out! What do I do now? 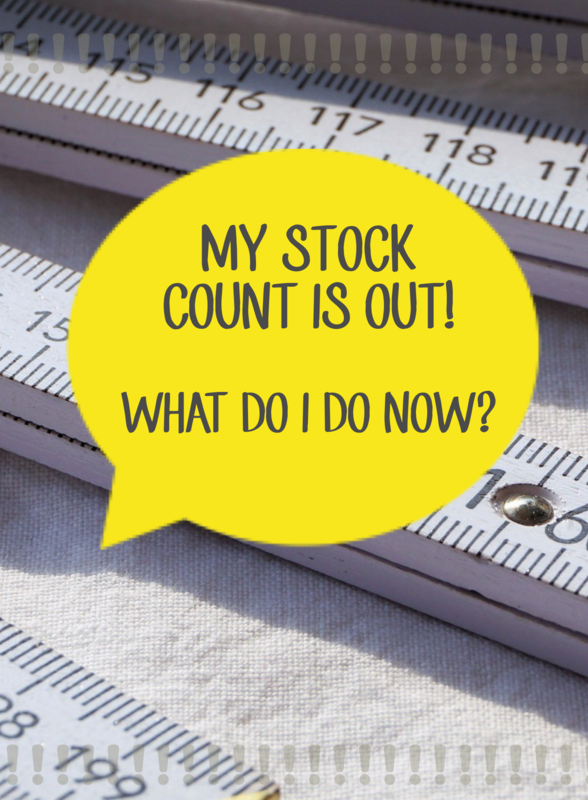 As we've discussed in previous posts, when using a perpetual (constantly tracking) inventory system it's preferable to do regular mini sample counts of your stock (or "cycle counts") during the year to identify discrepancies in your stock levels. So what do you do if you find from one of your stocktakes that your actual count is different to the stock level being calculated in your inventory system? Firstly, don't panic! Slight differences are a completely normal and expected part of perpetual inventory tracking, especially when running businesses that manufacture products. Treat any difference you find as a way of learning more about your manufacturing and costing process: the more you learn about the way you work and the materials you use, the more opportunity you have to improve your processes and products...and therefore your bottom line. So, where do we start once we have found a discrepancy? You'll firstly need to figure out if your numbers are more or less than the actual count as this will often point you in the right direction of the cause. If your numbers in Craftybase are showing a number higher than your actual count, then you'll be looking for reasons why you are missing stock. If your numbers are lower in Craftybase, then you'll be wanting to find out how you have ended up with more stock. Materials attributed to scrap in one manufacture are being re-used an returned to the system. A good idea is to write up a quick list of reasons for your particular situation so that you know what you should be looking out for. If you suspect your counts are out due to your manufactures being over- or under-estimated, you'll be wanting to pay a little more attention to the measurements on your next couple of manufactures and then comparing these to your current recipe (or past manufactures, if you aren't using recipes). This reason is often one of the most common, especially for those starting out with this form of inventory tracking. An important thing to note here: unless your product changes substantially each time you create it, you won't be needing to measure each time, you'll only be wanting to do this only when its clear that your estimates are out by a good margin. Once you have recalibrated, it's often a good idea at this point to also spend a little time reassessing your pricing to ensure that you are still making your desired margins given your material costings will change based on your new found knowledge about your production process. Is your Vendor shortchanging you? If you suspect the difference may be due to certain vendors providing more or less than the agreed amount then it's wise to start doing some quick mini counts when you receive your next shipments and log them into inventory. When a difference is discovered, you can either add in a manual adjustment or amend the actual amount received on the expense itself. Some types of materials will always suffer from miscount and inaccuracy where it's not always possible to guarantee delivering an exact amount to the customer: beads and buttons are good examples of this. However, depending on the type of material, you may decide to take this up with the vendor to see if they can start providing more accurate amounts to you in future: not only so that you can better rely on this part of your process for your quantities on hand, but also so that you can ensure that your own margins are not affected by any shortchanging that may be occurring. A good example of a hidden process that makes stock "magically disappear" is the shrinkage of fabric that occurs after washing. A significant amount of loss can occur in this process depending on the type of fabric being used so this is something to track closely. Once you have identified the process, you can now look into ways of estimating this anticipated loss more accurately: using our washing shrinkage scenario above, a first good step is to start measuring your fabrics after washing to find out their shrinkage rates and then apply these calculations to your recipe amounts so that your manufactures now allow for the extra quantity loss. Another option would be to make regular manual adjustments for the shrinkage and note as such: in this way, you'll be able to look back over your records and see exactly how much you "lost" via shrinkage. You can then use these adjustments to calculate your average shrinkage rates and then adjust your recipes going forward. Again, try to spend some time in reassessing your pricing once you have found a hidden process: if you are using more materials than you thought your margins will have decreased so it may be time to bump up those prices a little to compensate. There are many reasons for wanting to maintain accurate stock counts: doing it for the taxman for end of year reporting is only one of them. It's important to realise that the more accurate your manufacture records are in terms of material usage, the more accurate your pricing and profit estimating becomes as you now have much better awareness of your true costs. You'll want to aim for the situation where you have a minimal difference each time you do a manual count as this shows you that you are on top of your material usage and costs - this can take a while to get to this point depending on the complexity of your processes and it can be a frustrating journey at times. Be patient and hang in there - it's completely worth it in the end for the benefits it can bring to your business.